For the first 16 laps of today’s Malaysian Grand Prix, Valentino Rossi and his Yamaha YZR-M1 took us back in time to the days when he was reeling off world championships like the Chicago Bulls. We were brought hurtling back to Earth at Turn 1 of Lap 17, when The Doctor lost the rear and slid off, handing the win to the trailing stronzo Marc Marquez. Álex Rins and Johann Zarco joined #93 for the joyous podium celebration, but it felt like the end of an era. Make that nine wins for Marc Marquez and another constructor’s title for Honda. Conditions on Friday and Saturday morning for the winnowing were dry and hot, resulting in ten Q2 lambs with no surprises. FP1 was topped by Andrea Dovizioso, Rossi, Maverick Viñales, Jack Miller and Danilo Petrucci, with Rins sixth and Marquez, trying stuff out, in 10th. FP2 scrambled things slightly, with Rins, Marquez, Miller, Viñales and Petrucci on top trailed by Rossi, Dovi and Zarco. The weather changed Saturday afternoon, as did the fortunes of a number of contestants. With Alvaro Bautista and Aleix Espargaro matriculating into Q2 and an old-fashioned Sepang frog-strangler in between the two qualifying sessions, things got Vitamixed during the pole session. Marquez appeared to take pole easily but was penalized six grid spots for obstructing Andrea Iannone in the racing line and being a recidivist, giving fuel to his haters. This produced a front row of Zarco and Rossi on Yamahas and the aggrieved Iannone third on his Suzuki. The second row was an all-Ducati affair, featuring Dovi, Miller and Petrucci. Marquez headed row 3 alongside Rins and Bautista. The big loser in the changed conditions was Viñales, who went from the top Q2 qualifier to 11th on the grid, unable to get anything going in the wet. Marc Marquez was initially in pole position but was penalized for impeding Andrea Iannone during qualifying. Jorge Lorenzo, after sitting around in Spain for a few weeks, flew to Malaysia, gave his fractured wrist a go on Friday, and pronounced himself out of the race on Saturday morning, thus putting the screws to Alvaro Bautista and Karel Abraham, who might have had another memorable weekend on the heels of their success in Australia had he just manned up and stayed home. Fill-in Jodi Torres, subbing for the long-absent Tito Rabat, suffered a heavy crash in FP4 that would keep him out of the race and give him one more thing – for a total of three – in common with Lorenzo. (Spanish, motorcycle racer, DNS at Sepang.) Michele Pirro, however, came up a winner as he stepped onto Lorenzo’s bike on Saturday and qualified comfortably. After Marquez’s penalty, Johann Zarco was promoted to pole position. At the start, the leaders heading out of Turn 1 were Rossi, Zarco, Miller, Iannone, Marquez and Dovizioso. Dani Pedrosa, hoping against hope for a final career podium, was in the picture, while Maverick Viñales, the questionable Future of Yamaha factory racing, was not, having started 11th and running 10th early. Marquez had a major moment at Turn 15 which he rescued with Another Great Save, but Andrea Iannone, on his back wheel at that moment, had to brake to avoid #93, which sent him skidding into the kitty litter, a case of pure bad luck. For the second time this weekend, Andrea Iannone got caught in Marc Marquez’s wake, this time sending him crashing on the opening lap. Marquez, pushing for the love of the game only, went through on Miller on Lap 2 and Zarco on Lap 5, while Abraham was busy running off track. Pirro, the latest tenant of Jorge Lorenzo’s Ducati, crashed out a lap later. Despite Andrea Dovizioso having won the last two iterations of the Malaysian Grand Prix, it was a miserable weekend for the Ducati contingent, with Lorenzo in street clothes and, at the end, Dovizioso leading the brand representatives in 6th, followed immediately by Bautista, Miller and Petrucci, nearly boiled alive by the perspiration inside his leathers. By Lap 11, Rossi led Marquez by over a second, with Zarco, Pedrosa, my boy Rins, Dovizioso and a recovering Viñales trailing. Rins soon went through on Pedrosa into 4th and set his sights on Zarco. Rossi led Marquez by 1.3 seconds. 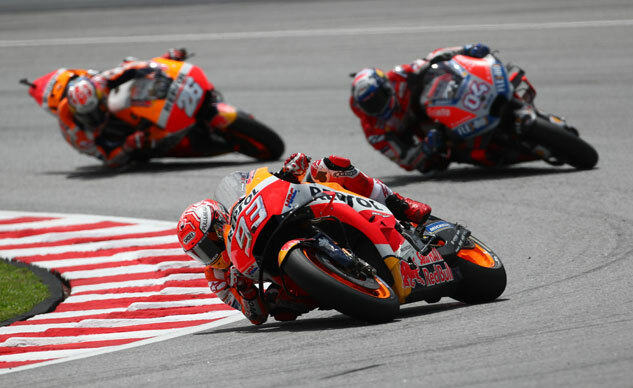 On Lap 13, Marquez put the hammer down and initiated a methodical chase of his rival. Unlike the usually quick cheetah-running-down-the-gazelle, Plains of Serengeti-style, Marquez’ takedown of Rossi was more of a fox and hounds affair, in which Marquez simply pressured Rossi to exhaustion, allowing the heat and Rossi’s age to combine for an unforced error that continued Rossi’s lamentable descent to the status of Just Another Rider. One might consider that a bold statement until ruminating over the fact that Rossi today finished just behind one Xavier Simeon, he of a single point for the year, who will someday tell his grandkids about The Day He Beat the Greatest Rider of All Time. It as a disappointing 18th-place finish for Valentino Rossi after leading most of the race. Once Rossi left the building, Marquez eased up, 4.5 seconds ahead of Zarco, who found himself, his tires seemingly Teflon-coated, being tracked down by Rins and Pedrosa. Rins would overtake the Frenchman on the final lap for second place, while Pedrosa equaled his season-best result, finishing 5th and securing the Colin Edwards “Stayed a Year Too Long” award for 2018. Rins thrusted himself into contention for the Best of the Rest, tied with Zarco for P5 for the year. These two, at least, will head for Valencia with something on the line. Álex Rins made a late charge to pass Johann Zarco and move up to second place. With Dovizioso having clinched second, it remains up to teammates Rossi and Viñales to face off in Valencia in two weeks for the dubious honor of third place for 2018, Rossi enjoying a two-point advantage as the Flying Circus returns to Europe for its death rattle. Any joy for Rossi today occurred during the Moto2 race, as Luca Marini won the race and Bagnaia, his teammate on Rossi’s SKY VR46 team, secured the title. With Jorge Martin having secured the Moto3 crown over Marco Bezzechi, the 2018 championships are done and dusted, framed and behind glass. His own race didn’t end the way he would have liked, but Valentino Rossi did have reason to celebrate at Sepang, with his SKY VR46 rider Luca Marini winning the Moto2 race and teammate Pecca Bagnai winning the 2018 championship. Jorge Martin won his seventh race of the season, securing the 2018 Moto3 title in the process. Francesco “Pecco” Bagnaia and the SKY VR46 Racing Team celebrate winning the 2018 Moto2 championship.